← Have a beautiful weekend! 01. I find it amazing how quickly the media has moved on after an incident at an Atlanta school on Tuesday. A gunman fired at and entered an elementary school and took hostages. Although no children were shot you would think that there would be more of a national conversation regarding school shootings and gun control, right? Oh, but, this occurred at a mostly Black school. So, never mind. 02. Do you have a green thumb? I do. I’ve had a green thumb since I was a kid. My mother used to keep house plants in the picture window of our living room. They were in pretty bad shape. Then when I was about 6 or 7 I started taking care of them. They flourished! Since then I’ve had great luck taking care of houseplants. I’m not sure why I’m good at it but, there’s a bunch of stuff that I’m not good at so I’m just going to enjoy being good at this. 03. Have you seen The Butler? I haven’t. I still haven’t seen The Help. I wonder what’s going to be the next film about us. We’ve already had Driving Miss Daisy, so that covers driving. We had Corrina, Corrina, starring Whoppi Goldberg, about a nanny. So, what’s next? The Cotton Picker? The Shoe Shiner? I think there is a place for these types of historical films but, can we get a love story? Or a sci-fi flick? Or a coming of age drama? All we get are crazy comedies, Black dysfunction films or these historical dramas. Sigh. 04. Welp, Summer is almost over. Labor Day is just about a week away. I had a very quiet summer. The Girlfriend and I only went on one trip. That was to Santa Cruz. 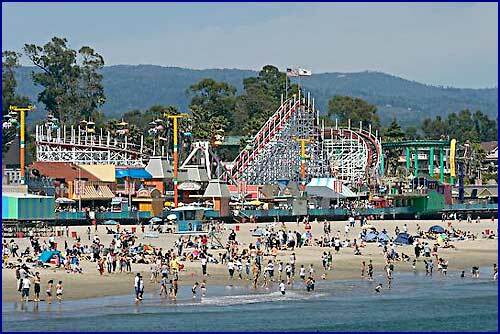 They have a really nice boardwalk there that’s an amusement park. I really prefer to travel in the Fall and Winter. There are less crowds and cheaper fares. What about you. What season is your favorite for travelling? re number one: the fact that this was a black school hasn’t escaped me. Thank God no child was hurt. But if, God forbid, black children WERE killed or injured, the media would never give it the same attention as the slaughter in Newtown, CT. Trust. I feel you on number 3, Val. Part of the problem is we don’t have any Black Actors who will REFUSE to play a part, like Cicely Tyson used to back in the day. These days, maybe actors are so damn hungry for work that it doesn’t matter what role they take as long as a decent paycheck is attached. For a Black Coming of Age Drama, read my new book, “Like Litter in the Wind”… dammit! *smiles* No. Seriously… READ MY BOOK! That’s true, Lin. It seems they can always find a Black actor to play whatever they want then to. Angela Bassett is another actress that turns down roles. She turned down Monster’s Ball. I am definitely going to read it, Lin! I read “Like Litter in The Wind” last month, I really enjoyed it. I still don’t understand how black kids are never afforded the same media coverage as their counterparts. I mean, this is something that really really bothers me. A school, at that, and the media coverage is little or none. What is there to make of it except the issue of race? I enjoy traveling in the fall and spring. I can’t deal with the excessive temperatures during the summer. I’m looking forward to traveling this fall and watching a few NFL games and a couple other places. We were supposed to see The Butler last week, but we decided to check it out this weekend. I am curious to see if it’s a good or bad film like the reviews have indicated. Also, my cousin bought me a plant last summer that I messed around and stop taking care of. I thought it was dead, but my woman assured me that the roots were still present so I took the time to really tend to the plant and it is beautiful as ever. I am seriously proud of my efforts and how I returned it to life. I often use my plant as an analogy towards love. Lol. That’s the thing, Don, it’s just so obvious that Black kids get less coverage unless of course they’re accused of committing a crime. Going to see your Saints? That should be fun. How we take care of plants is a good analogy to how we love. Nice. The disparity is really shameful! At least Anderson Cooper interviewed the bookkeeper ans the 911 dispatcher, both if whom handled that situation with great skill! But I haven’t seen parents being interviewed. Aww Val, that’s really sweet! Six or seven and taking care of plants! You give them love and so they flourish! I like to think I have a green thumb 🙂 I try anyway, with some plants I’ve done well, others not so much. That boardwalk sounds fun! I don’t travel much anymore, but when I did, I did like it better on non seasonal times also. I originally thought The Butler was a true account of the mans life so I wanted to see it. When I found out it was fictional and just ‘inspired’ by his life, I changed my mind. Yep, she got a little bit of hype but not enough. She is truly a hero. And, as you know I don’t throw that word around easily. The boardwalk is a lot of fun. I’m not really into the rides but they have concerts in the Summer and it’s fun just to walk around. Yeah, the whole film is just Lee Daniels’ fantasy. No thanks to that. I had enough of him with that film Precious and Monster’s Ball. III. I’ve not seen any of the movies you listed, for pretty much the same reasons! I don’t think I want my books to be made into movies, either, because the characters would be whitewashed and destroyed…my vision and world would be twisted and the thought of that offends me greatly. – Yeah, the coverage would have gone on for weeks with every possible angle explored. – I agree. I read PUSH a really long time ago and remember being enthralled by it. Then Precious the film comes along and ruins my memories of the book. I won’t let that happen again. – Oh my, I just cannot take Summer crowds! For me Summer is for hanging out at home and enjoying sitting in the yard. Also, I hate travelling in the heat. Fall and Winter are just so beautiful to me. And, trains and roads are less travelled as well.